Game developer Volumique and publisher IELLO are looking for help from the community to finish World of Yo-Ho, their cross between mobile games and board games, that turns a player’s smartphone into their pawn, for use on a real-world game board. The fantasy adventure game is focused on piracy on the high seas and will challenge players across multiple gameplay modes. World of Yo-Ho is for two to four players, and allows for pass-and-play on a single smartphone or tablet, in cases where every individual player may not have their own device. In this case, tokens included with the game represent ships on the board instead. In the game’s classic mode, it’s a free-for-all to earn the most victory points (here called Swag points) in a turn-based game. Meanwhile, campaign mode is tied to the first part of the World of Yo-Ho story, called War of the Orchids. Finally, a single-player mode is available for players to get up to speed on how the game works alongside their smartphone, or just learn more about the game’s lore and setting. 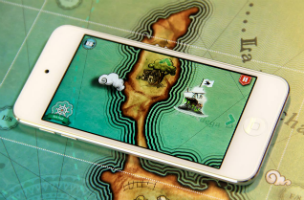 While playing World of Yo-Ho, a user’s smartphone becomes their ship, and each phone is placed on the grid-based map to represent the ship’s position within the world. From there, the screen’s display automatically changes based on the orientation of the ship on the board, or in the player’s hand. As users play, they accept missions at ports, like cargo transportation trips and explorations for finding sunken treasures in monster-infested waters. Missions and events are randomly generated during each game and evolve depending on player choices. For instance, a player could be a respectable captain and peaceful merchant, or a ruthless pirate out to dominate the ocean. Players acquire item cards at ports, including weapons that can be used in battle. Each card has stats that may increase the player’s charisma or strength, or even lower a stat, depending on the card. During battle, players lift their phones from the map and secretly select the items they’ll use. Once this preparation is complete, users place their smartphones back on the board and watch the battle play out across both device screens. The winning player can then pillage the victim’s ship. Elsewhere, port locations can also be used to repair a damaged ship, check on the status of other players (to see if they’re close to victory) and purchase upgrades for a ship or captain. As of this writing, World of Yo-Ho has raised over $30,000 of its $50,000 goal on Kickstarter, with 18 days remaining. More information on the game is available here.